Come see the very funny national touring headliner Mark Riccadonna! Part 1 of 4 Winter/Spring 2019 Comedy Night Series! Enjoy a romantic date night out with your beau and some laughs with good old fashion comedy, beer, and food! 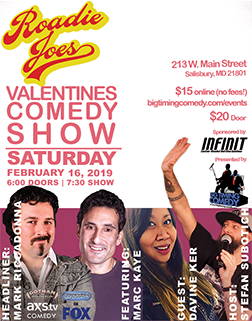 So come out and support eastern shore local business Eric Jolicoeur and Baltimore native Stefan Subotich of Big Timing Comedy and Roadie Joe's team up for a fun night in down town Salisbury Maryland!